Logins this hour: 12824 ? Tally weights allow schedulers to add values to shifts on any given day. By codifying a weighting system, the you can balance your staff's workload. For example, if hours worked on Saturday and Sunday are worth more than those of Monday through Friday, you will want to give anyone who works more Saturdays or Sundays fewer shifts in total. By assigning weights to certain shifts you can assess whether the workload is balanced for all staff. To set up tally weights, select a shift name to the left of the schedule. In the infobox window select, "Tally weights." In the Tally weight window, input your weighting system. If Saturdays and Sundays are worth double the value of Mondays through Fridays, place a "2" for Saturday and Sunday and leave Monday through Friday as "1". The tally weights appear as "Points" on the far right of a "Day" tally report on your Statistics, page. You can adjust the weighted tallies to account for extra or missing credit from a previous schedule period. Tally-weight adjustments affect only the weighted tallies which appear in the Points column on the tally page. 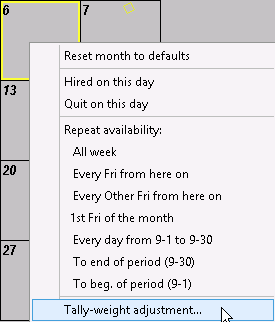 Go to the Work Preference, page and right click in an individual's calendar on the day you want to apply the adjustment. Select Tally-weight adjustment ... from the pop-up menu. 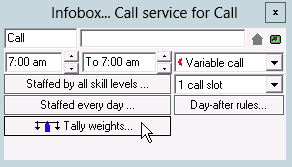 The option to enter a tally weight will appear only if you have one or more shift weights that differ from the default of 1. A note pad appears with the string, "Tally weight adj. = ." Enter a value after the '=' sign. Once you enter a number, the graphic that designates the note, changes to signify that it is a tally-weight adjustment.